I hope your weekend is going well! I had fun creating using one of my new stamp sets from the brand new Stampin' Up! Annual catalog. It's called Stitched All Around and it has gorgeous sentiments to create cards or tags. 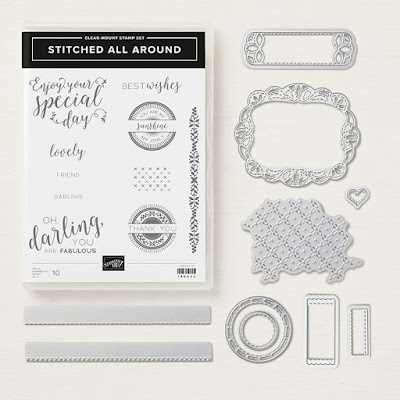 They are perfectly cut out and "stitched" by the on trend frames and tag shapes in the Stitched Labels Framelits set. The bundle saves you 10% when you purchase the stamps and dies together. I also got to play with one returning and one new color: Coastal Cabana and Gorgeous Grape. I love these two colors together! And that lovely Polka Dot Tulle Ribbon! I couldn't wait to use it! It ties a lovely and easy bow for a card you will give in person. Imagine it on a package or a tag! Thank you for visiting my blog today. I hope you have a great day! Please leave a comment so I know you were here. 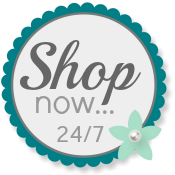 When you are ready to order your Stampin' Up! products, please use my Online Store. I appreciate your business!